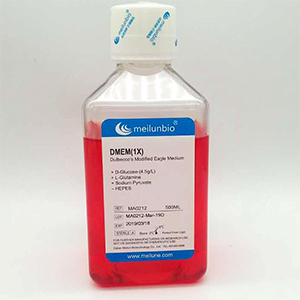 DMEM (Dulbecco's Modified Eagle Medium) is a widely used basal medium for supporting the growth of many different mammalian cells. Cells successfully cultured in DMEM include primary fibroblasts, neurons, glial cells, HUVECs, and smooth muscle cells, as well as cell lines such as HeLa, 293, Cos-7, and PC-12. 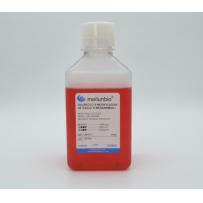 We offer a variety of DMEM modifications for a range of cell culture applications..
使用建议： DMEM is unique from other media as it contains 4 times the concentration of amino acids and vitamins than the original Eagle's Minimal Essential Medium. DMEM was originally formulated with low glucose (1 g/L) and sodium pyruvate, but is often used with higher glucose levels, with or without sodium pyruvate. 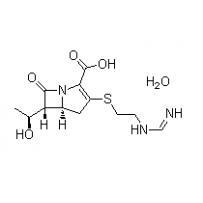 DMEM contains no proteins, lipids, or growth factors. 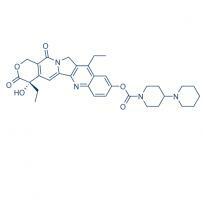 Therefore, DMEM requires supplementation, commonly with 10% (FBS). DMEM uses a sodium bicarbonate buffer system (3.7 g/L), and therefore requires a 5–10% CO2 environment to maintain physiological pH.